One of the most important things in the robot design is the possibility to check and control the values feeded by the analogic sensors, i.e. accelerometers, gyros, IR sensors. In order to view the sensor values you can use the Serial Port that can be displayed in the Serial Monitor inside the Arduino IDE environment. But it isn’t possible to show charts or save the data read from the sensors. There are several software that allow to show the graphs derived from the sensors data, and I published in the past a tutorial (here). Usually you use Processing or similar language that require always to write some code. You have to write code to change the charts or to implement new lines in the graphs. I thought that the ideal situation would be to use a software that everyone knows: Microsoft Excel. If it were possible to use Excel to receive the data from the serial port, it would be easy to make very nice and user friendly charts. I searched in Google and i found a sw that allows easily to view the serial port values in Excel. 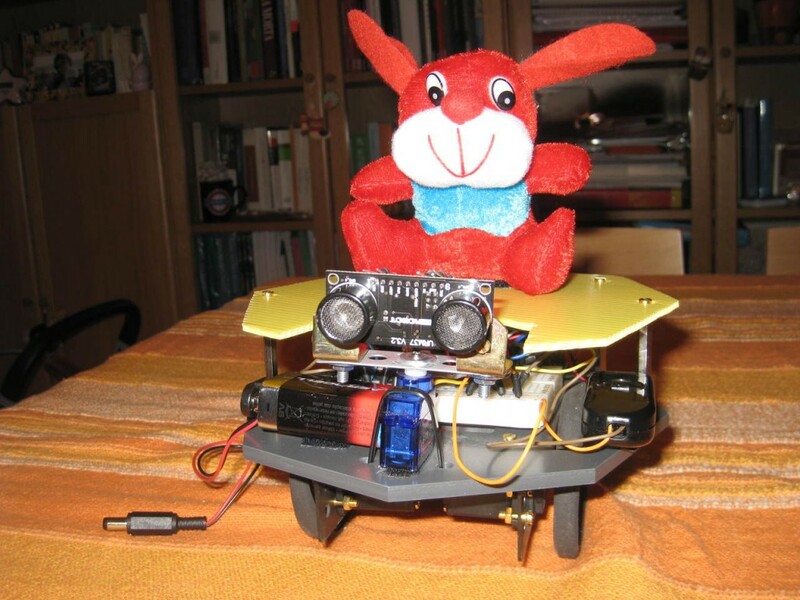 The sw is made by a competitor of Arduino, Parallax, the company that sells the Boe-Bot and the Propeller, wich are in direct competition with Arduino. The sw is called PLX-DAQ and it is a free software. You can download it here. It works only in Windows, sorry. 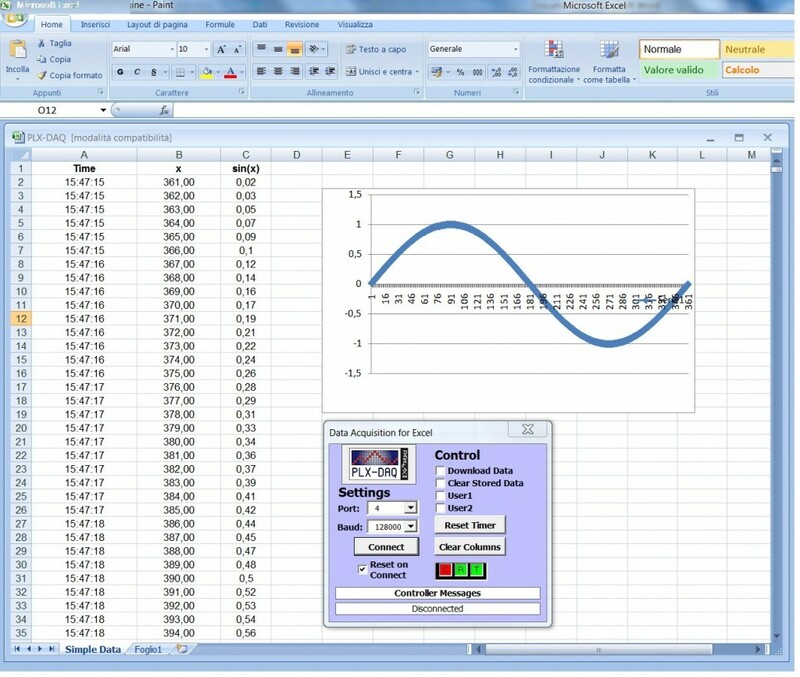 In practice it is a little sw in VBA that adds some features to Excel to receive and elaborate real time data. If the data are in Excel it is also possible to save them in a file and it is possible to use the amazing function library already present in the spreadsheet software. The documentation about PLX-DAQ is complete and clear. The PLX-DAQ takes commands in uppercase and every data row have to end with a ‘carriage return’. The serial port speed required by PLX-DAQ is particular, because it derives from Parallax world. In any case the rate is from 9600 bit/sec to 128.000 bit/sec. The speed of 128.000 bit/sec works fine in the Arduino!! ROW, SET, k, allows you to define the next line to write. It is useful if you want to plot n data and then go back to first row and cycle. For example, you can plot 1000 data on the chart and then start again from the first position, in order to avoid a graph too large. The command format is: Serial.println (ROW, SET, 2) put the cursor in the second line next step. Here’s an example that shows Excel function sin (x). PLX-DAQ enable a more complex interaction with Excel. It can take the cell values from Excel, it can read and write check box. You can see the PLX-DAW documentation for other details. The text-to-speech is the best way to do a robot talking. You write a text, and he reads the text: this is the fastest way, but you need a chip that implements the text-to-speech. It is easy if your language is English, not easy if your language is different. For me, the language is the Italian and I haven’t found any cheap chip for italian text-to-speech. So I used the second method, recording the voice. The method is more complex, but at the end the result is the same. 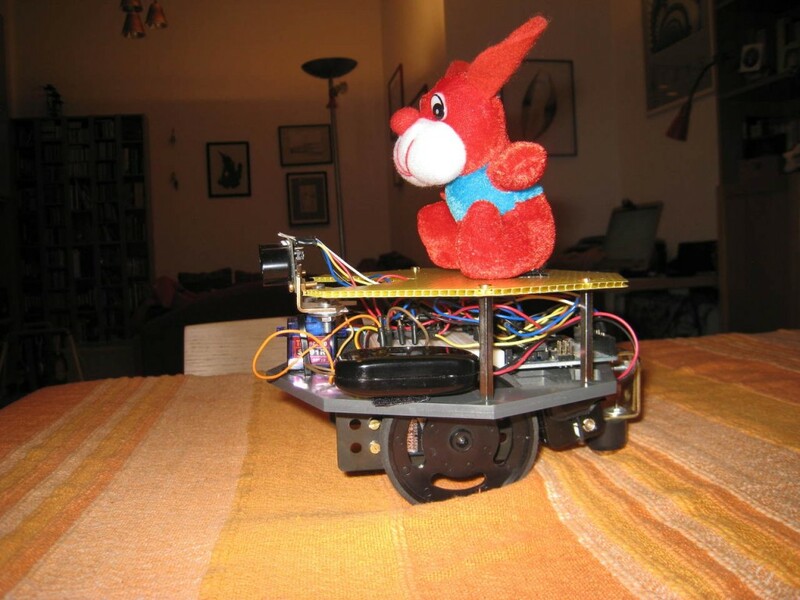 The little robot is based on two projects already presented in the past: this and this. In these links you can find some details on the building and the hardware. It uses a DFRobot URM37 Ultrasound sensor and a SOMO-14D audio chip, used to talk. This audio chip is low cost (20 euros) and it works with few components (only one 220uf capacitor) and it can be set with an Arduino. The SOMO-14D plays only files codified with a proprietary format (AD4). But it is available a practical sw that converts MP3 in AD4 format. In order to allows to talk to the robot, I used a software for italian speech(called Er Finestra), but you can use the speech software you want. For almost all the languages a similar little utility is available. One problem resolved is due to the fact that Er Finestra can only say something. It can’t at the same time to say and to record. So I downloaded Audacity, an editor audio free, that can record every sound that pass in the sound card. So you have to start Er Finestra and at the same time to start Audacity that records the phrases read by Er Finestra. Then you can convert the Phrase from MP3 to AD4. The process could be seem complex, but it is more difficult to say than to do. I read with Er Finestra 40 pieces, I converted them and the robot can say them randomly. It is possible to use an intelligent algorithm in order to say something responding to external stimulus. For example, to say ‘turn right’, ‘turn left’ or something of similar. The audio chip can play also musical pieces, songs, so it is possible to see the robot going around singing ! //Semplice robot autonomo con sensore ad ultrasuoni per evitare gli ostacoli e chip audio per parlare o suonare una canzone. //Simple autonomous robot with ultrasonic sensor for obstacles avoidance and audio player chip. It can speak or play a song. One of the problem building a robot is the choice of motors. 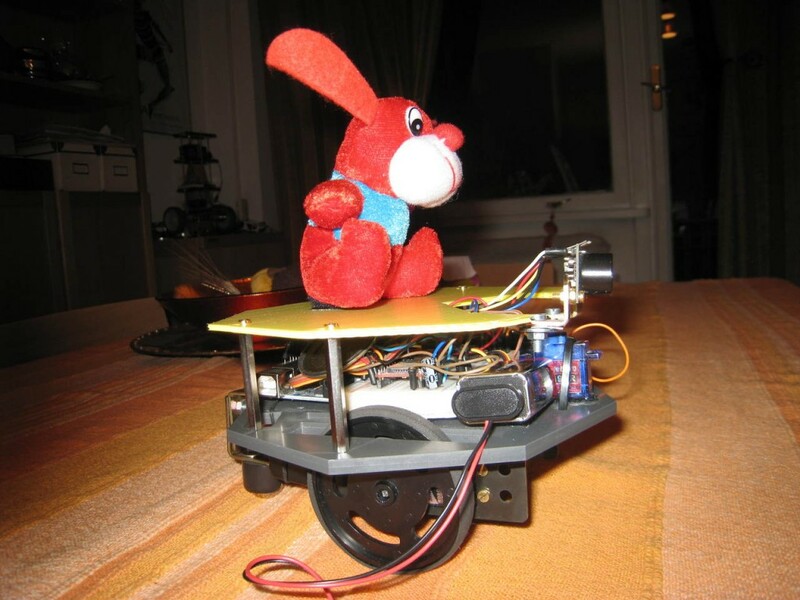 I’m speaking about a mobile robot with wheel. So, I’m not speaking about legs or others geometries. A simple robot with 2 wheel that goes around in the house. So a robot moving on a flat surface, no hills. Without tracks, without rough terrain. No SUV! In this situation the calculations are complex and out of the aim of this little tutorial for beginners. 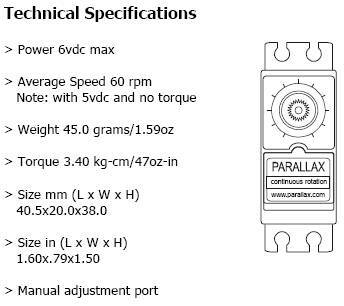 First we can start from the value usually reported in any motor datasheet: the torque. The torque is, in the rotation, the equivalent of force in the linear motion. To push a box, bigger it is the force, bigger it is the acceleration. For a wheel, bigger it is the torque, bigger it is the wheel acceleration (rotational). In the datasheets often it speaks about stall torque (start-up torque, stall torque) and, somethimes, about nominal torque (rated torque). The start-up torque is the maximum torque that the motor can provide. But when the motor is in stall, the motor is stopped. So it isn’t very useful. It would be useful to have the rated torque, that is, (approximately) the maximum torque that ensures continous operation of the engine, without problems. Now, we can consider the robot motion formulas. There is a formula that links the motor torque with the robot weight and acceleration. So this formula provides us a very important information. That is, knowing the robot weight (in kg), knowing the acceleration desired, this formulas says wich is the torque that we have to consider in the motor choice. – robot mass (you can put the robot in a balance and read the weight in kg). – the robot acceleration desired. For example, 0.5 m/s^2. This means that we start the robot motion, after 2 seconds it will have a speed of v=a*t=0.5*2=1 m/s, i.e. a meter for each second. Not so bad for a home robot. where: C is the rated torque of the motor, r is the wheel radius, m is the mass, a is the acceleration and Fattr is the attrition force (here mostly rolling) between the wheel and the floor. Basically, when we have to calculate the torque, we can double the torque deriving from the m*a calcolation. Maybe, this could be a conservative calculation, but we can be serene in the motor choice. So the engine should have a 4 N*m torque. The motors often have a torque indicated in kg*cm. So we have to divide by 9.81 (approximately 10). So you get a motor with a rated torque of 0.4 kg*cm, and 0.8 kg*cm of start-up torque. Easy or not? Now consider the speed. Suppose we want a robot whit 1 m/s of speed, that means 3.6 km/h. 100/25.12 revolution per second = 3.98 revolution per second. knowing that in a minute there are 60 seconds, you get the revolutions per minute (rpm), another data often written in a motor datasheet. With the data of torque and the rpm we are able to choose the right motor. All the formulas are simplified, however, it is enough for beginners and for DIY robot builders!